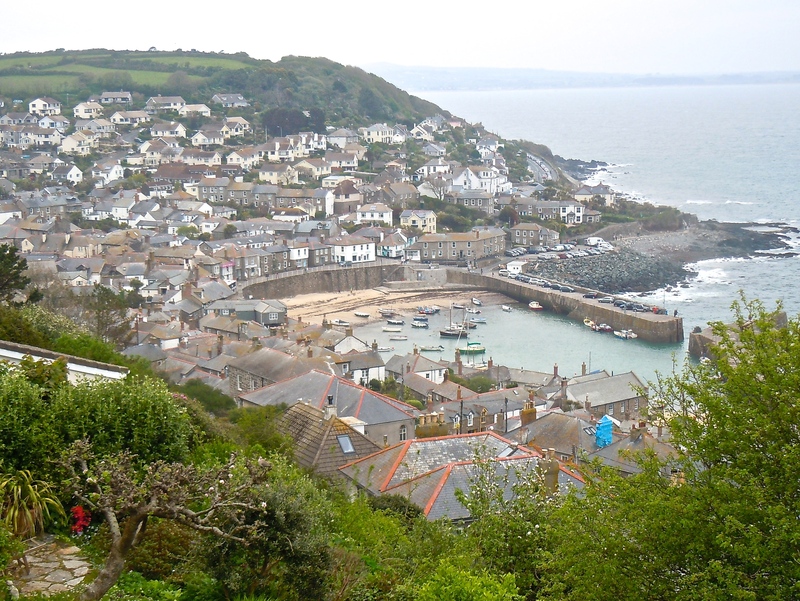 If you were of a mind for a nice hike along the Cornish coast, you could leave Penzance and follow the South West Coast Path to Cliff Road. 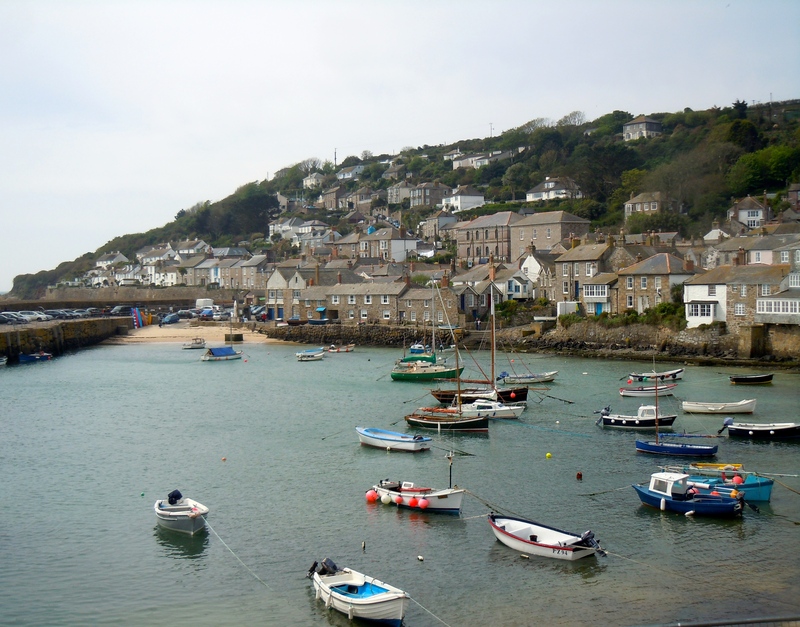 And in about 3.5 miles you’d find yourself in the charming town of Mousehole (pronounced locally as mowz-ul). Since we’re continuing on to Lands End and Sennen Cove, we’ve chosen to drive the short distance. The day is blustery with a backdrop of blue, dappled with pale grey clouds that keep us wondering how long the rain will hold off. We park just to the east of town and walk in as the wind picks up. Mark, ever in need of a beach day, takes the steps down to the Wharf area where the tide is on its way out and some children are playing ball in the sand. 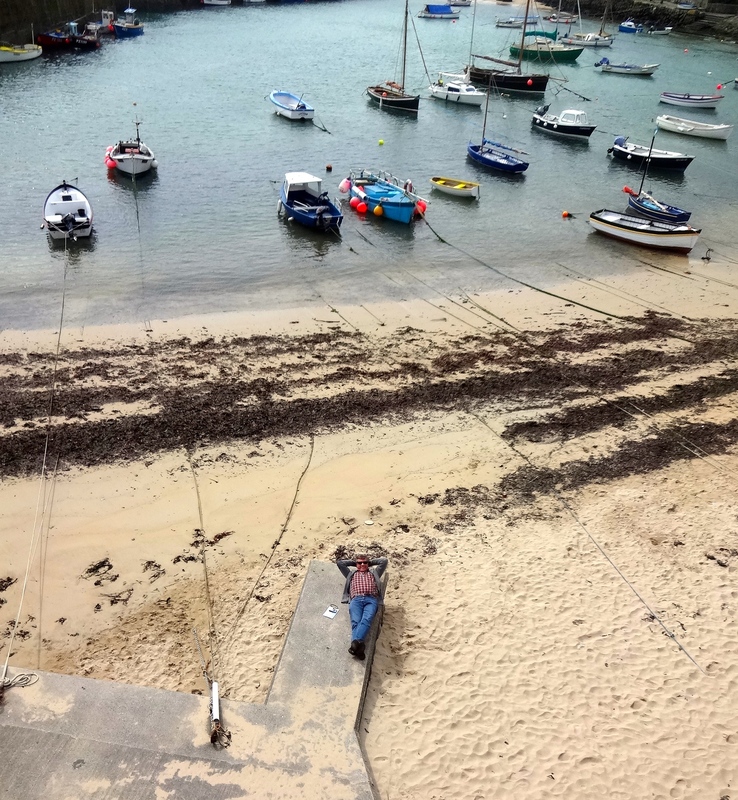 We wave and take photos as he lays down, closes his eyes and pretends that the English coastal wind is tropical. Back in the real world, Derek, Cath and I are targeting a few shops to browse through and pondering which quiet, charming lane will take us to the crest of the hill. 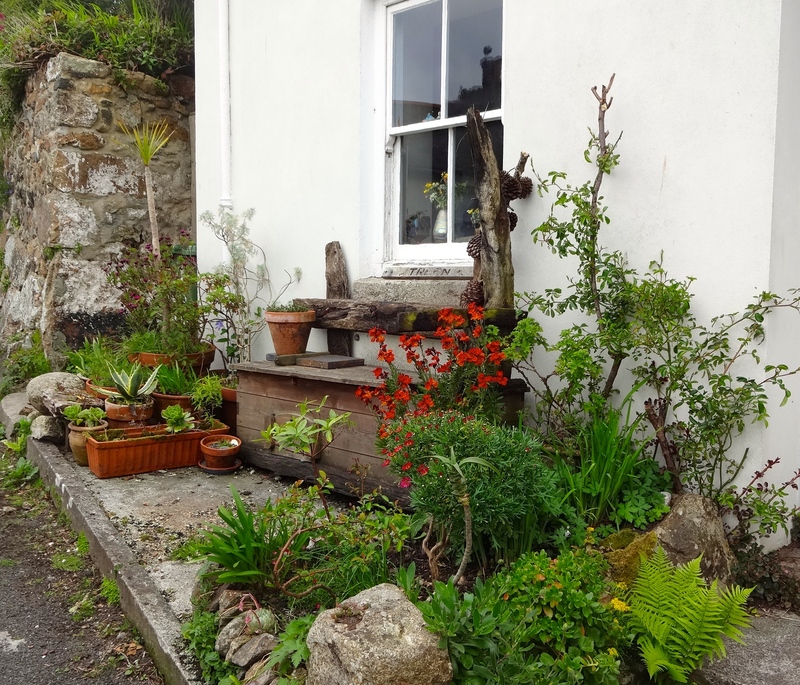 Mark rejoins us with a walking map of the town, so we follow his lead and head up a quaint side street where lovely cottages are interspersed with art galleries and craft shops. 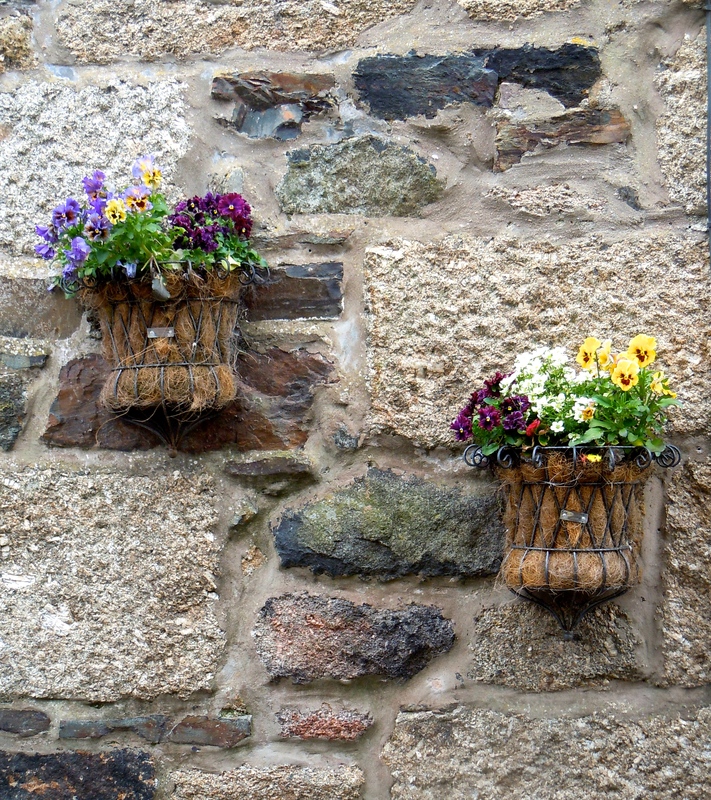 Nooks and crannies are filled with pots of flowers. 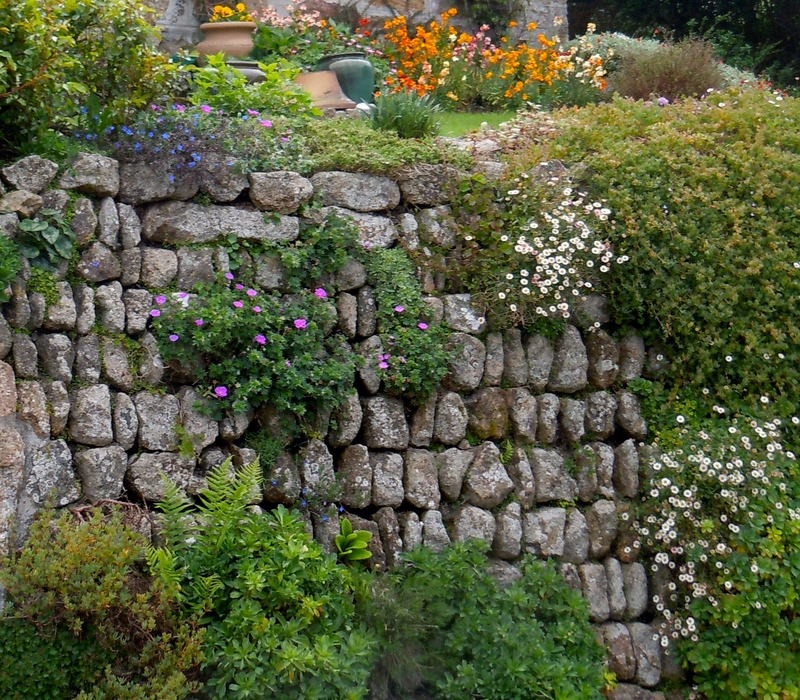 Stone walls are splattered with wild flowers growing out of cracks and crevices as if Jackson Pollack had a hand in the coloring of this place. 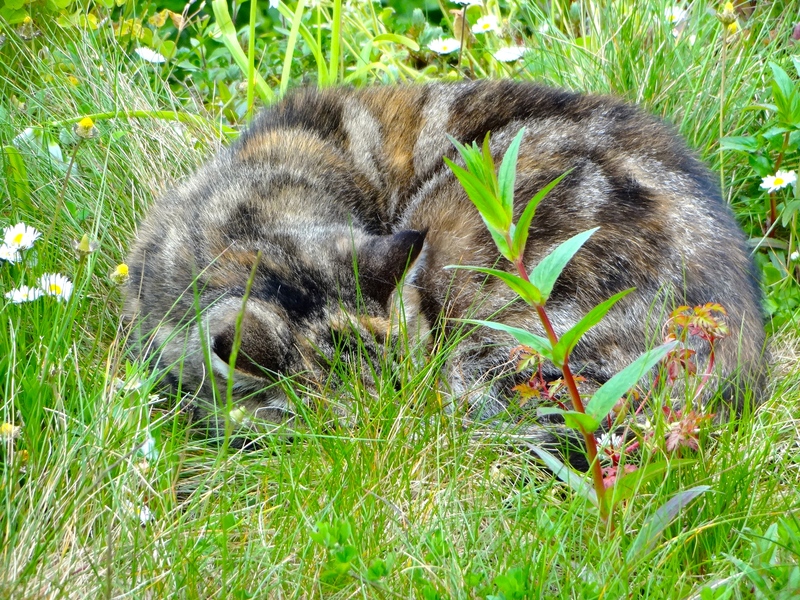 Cats are sleeping in beds of grass, peering at us through windows cloaked with lace or slipping through alleyways with an air of disinterest. Reaching to pet a large black and white Tom perched on a rock wall creates a flurry of activity as he realizes he may have found a friend who will give him a nice pet, and so he follows us for a bit before getting bored. We haven’t seen a live mouse since we got here! Mark leads us up side streets and back down curved lanes. All around this charming town we follow him, until we come to a set of stairs covered partially with moss. The steps are old and steep. A small water fall heads down the hill next to us as we make our way up and up. 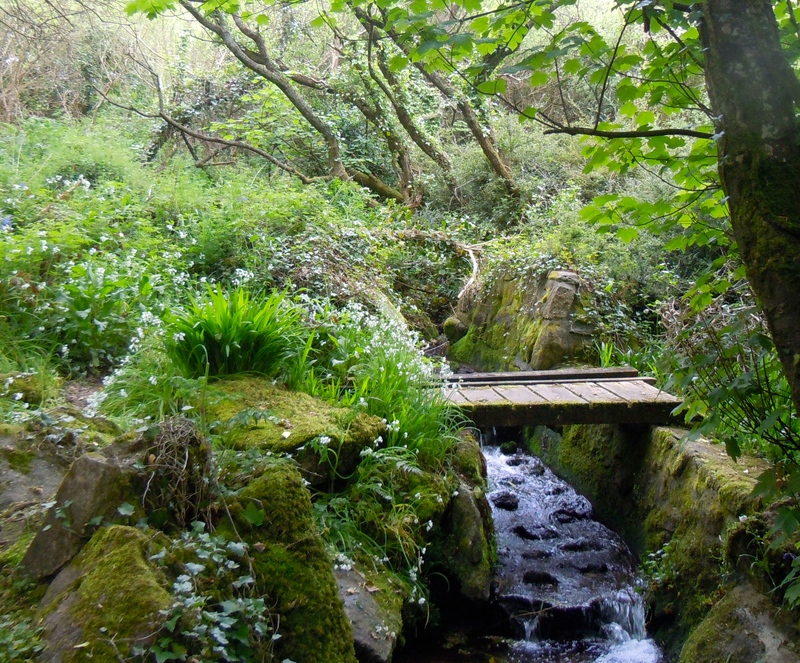 A wooden make-shift bridge crosses the flow of water, but we continue to climb. At the top, we are greeted with a stand of elephant fronds as big as we are tall. A wide path takes us to a gate at one end, and so we turn and follow the path to the other side where we can see beautiful homes perched high on the hillside above the town with amazing views of the ocean. We walk this path for awhile, but see no other way down, so we head back to the steps and make our way back to town. As rolling dark clouds move in, we duck into Pam’s Pantry (3 Mill Lane) just as a light rain begins to fall. 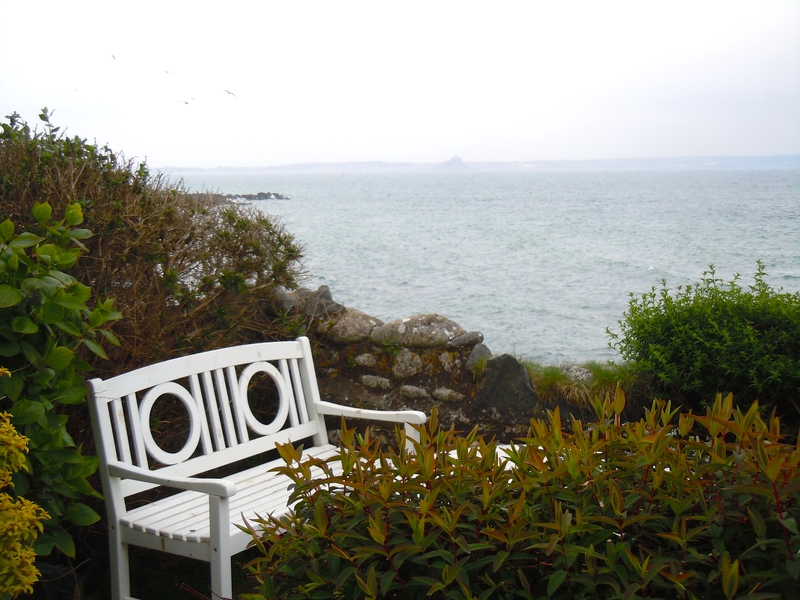 Our timing is perfect and after a lovely lunch, we continue our walking tour by the sea where the wind is blowing and the gulls are soaring above the waves, catching the updrafts and laughing in the way that they do. 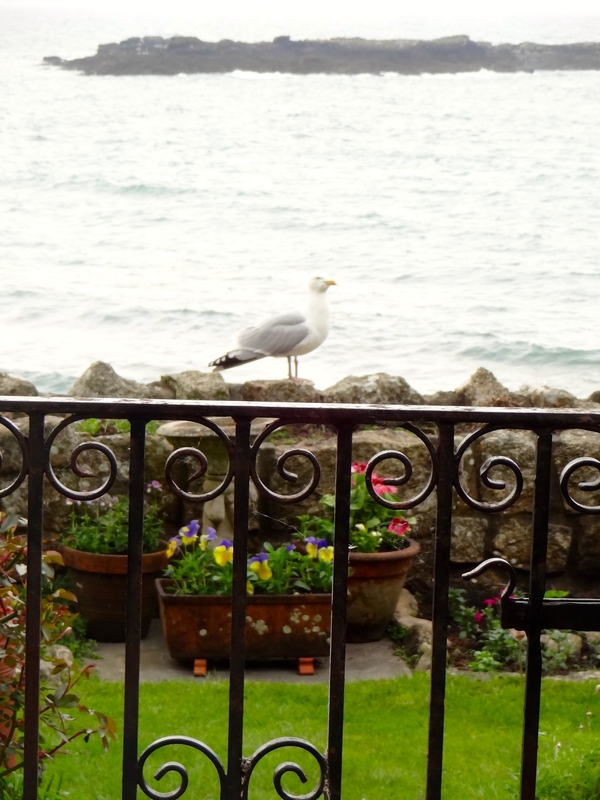 Along the coast of this lovely village, poised above the sea, we are struck by the rustic charm and beauty of gardens. Closed off by low walls and gates, each appears to ‘belong’ to the cottage on the other side of the road. The sun comes out briefly, creating diamond points of light that spark off of the many brightly colored flowers that thrive in the cool dampness that is England. 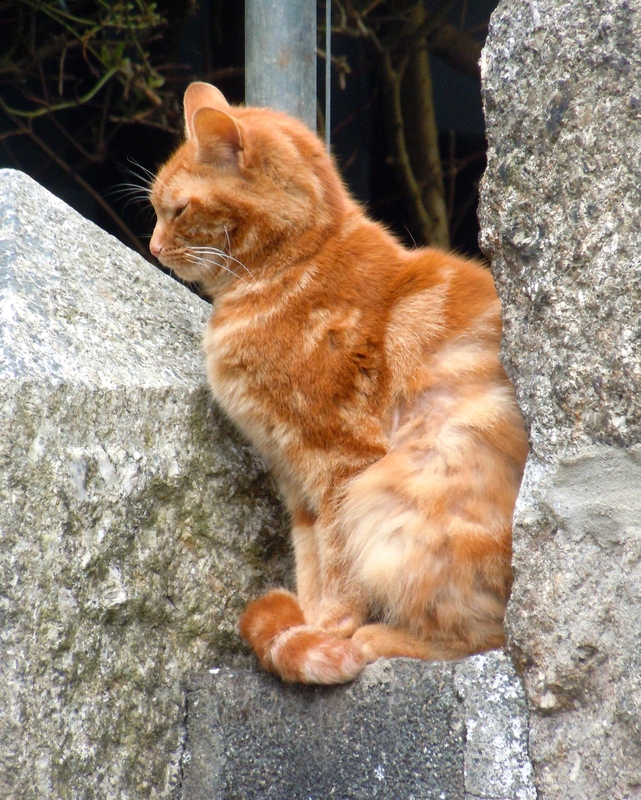 This entry was posted in Cornwall, England, Travel and tagged Cats, Gardens, Mousehole, Pam's Pantry, Penzance, Walking tours.